Google just announced a new update concerning Gmail app for those using android device. 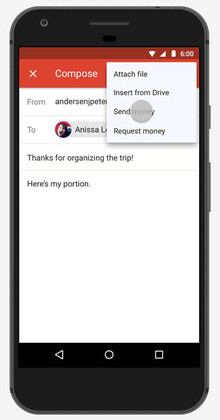 Google officials are doing their best in order to see that sending and receiving money through Gmail app with Google wallet, becomes easier unlike before. In order to accomplish their mission of making payment easier, they updated their Gmail with a better feature which can serve all better. The Google wallet service, which has been around for over 4 years now, was embedded on Gmail for the sole purpose of making appropriate transaction that is channeled to sending and receiving money via the account. This should be on Gmail web, Meaning you must have access to internet connection and as well Gmail account for signing in, in order to access the Google wallet. The good News as it stands now is that, the service has been updated and as such, those using android smart phone can now access the service it offers through their Gmail app having the app installed on their phone. And another thing is that, the transaction is been done within the Gmail app without the need of any-third party app. So to use this service, all you need to do is just to login using your Gmail account. After you have been logged in, just at the top right corner of your screen, you will see an attachment icon, now click on "receive money" or "send money" depending on what you are doing at the moment. That’s all for that, but it’s quiet Unfortunate that the service is currently available only in US as it stands, but is expected to reach other region any moment from now. Stay tuned as more update will be coming concerning this post. Thank you.